Vicky White thought she'd seen every reaction a horse could have to massage therapy. But, she was astonished when the horse she was working on gave a heavy sigh and slowly crumpled to the barn floor. A soft snort reassured her. The horse wasn't in trouble, it was just so relaxed it had fallen into a deep sleep. Vicky got her first horse when she was five years old. That horse set her on the path to a lifetime career. 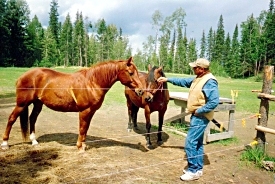 For thirty years, she's been a professional buyer, seller and trainer of horses in the western U.S., western Canada and Alaska. When she heard about equine massage therapy and saw it performed, Vicky was impressed. She researched it and was accepted as a student in the school in Manhattan, Kansas. Some of the other students assumed it would be simple. It wasn't. "You had to know anatomy, all the muscle groups, the muscle structures of a horse, the how and why of movement, identify lameness problems and work satisfactorily on horses to pass." Vicky remembers. She passed with l00% and there was a job waiting for her when she was done. There aren't many massage therapists out there yet; most trainers are still skeptical. But there are more and more believers, and some of the big name trainers, such as Monty Roberts, now use massage. 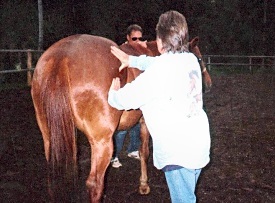 At Palomino World in Oklahoma, Vicky was the massage therapist for NuPeppyChex, a world class stallion. In a barn of eighty-eight halter horses in Missouri, Vicky massaged world champion horses to get them ready for the big shows. "It's good to see horses come from nothing to world class and these horses were great." Vicky is impressed by equine massage therapy for many reasons. "It's holistic and non-invasive. It requires a knowing touch, not just strength. Five to twenty pounds of pressure is enough. If you press too much the horse will tell you. " Forms of massage therapy go back two thousand years to the ancient Chinese. Greeks and Romans used it, as, more recently, did the Hopi Indians. "Even when you're brushing your horse, you're massaging it. It's relaxing and bonding as you learn to read your horse. Horses know you're trying to help them and they respond to that. ", says Vicky who incorporates it a lot in her regular training. Working muscles dispels toxins out of the lymphatic system; it moves lactic acid out, so the horses recover faster. For this reason massage therapists are getting really popular at the track. Massage prevents injury and, if there is an injury, massaging the horse can help it recover without all the drugs usually used. "If you pay attention.," Vicky states, "the horse will tell you where he hurts. People say 'My horse is lame in the left shoulder.' The horse may be lame in the left shoulder, but, it has muscle problems in the right limb and is over-compensating. You have to work muscles on the opposite side to fix the problem. You have to have a feel for all the horses you work with and really look to see where the injury is." Massage speeds healing, reduces inflammation and scar tissue, relieves pain, loosens tight muscles, stimulates the production of synovial fluids, relaxes an excitable horse and gives strength and flexibility to a tired one. Seeing is certainly believing. I was present when Jimbo, Vicky and Roger's horse, slipped during his evening exercises. He came limping up to them, obviously in severe pain, not wanting to put his right foot down. Vicky gently massaged his right hindquarters for about forty-five minutes. The tight muscles visibly relaxed under her treatment. 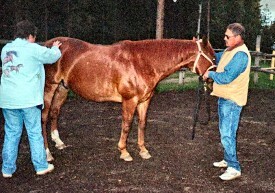 Jimbo was left in the pasture that night so he'd walk around and keep the muscles flexible, not have them stiffen standing in the barn. Next day he got another half hour of massage, and, the day after that, was ready to go riding. An injury which might have resulted in permanent damage, or lengthy recovery, was healed quickly with no lasting harm. The Europeans began the recent interest in equine massage therapy. Gradually this form of alternative medicine is being accepted in North America. Vicky feels that the results are so obviously beneficial it will soon come into its own here. For further information call 250-566-3234.